It was Thursday around 1pm, I was at work and I had no idea what I was cooking for dinner. I had recently converted my office into two. One half was for my husband's business and the other half was for What's Cooking Ella. I had recently moved over a tonne of magazines and magazine clippings. So I picked up a folder and went on a search of what I was going to cook for dinner. All I had at home was green beans that I didn't use the day before, so I wanted to incorporate green beans into todays dinner. In this folder side by side were two recipes, Thai Fish Cakes and Thai Chicken Cakes, both used green beans, so I thought why not try both, as they were easy, very similar, and because my daughter isn't home until 7pm on a Thursday, I have time to prepare both. So I leave work, go to supermarket first to get some more ingredients, then off to my favourite fish shop, buy the seafood I need, pick up my kids from school on the way home and get cooking. These were so easy to make, a bit of blitzing and chopping. I made them around 4pm and cooked them around 7pm, I just kept them refrigerated until they are needed, remove them from the refrigerator around 30 minutes before you need to cook them. I have never seen my family eat something so quickly, they went crazy for these, a bit of feeding frenzy. They loved the sauce that accompanied it, they loved the fish cakes, it seems I didn't make enough. I was strictly told next time I needed to make more. Now I don't know what magazine this came from, so I can't tell you, it was just a clipping I found. But they advise (and I have not done this) that the recipe can be made several hours ahead. To reheat you place the fish cakes on an oven tray, cover loosely with foil, bake in a 180C/160C fan forced for about 10 minutes. So if you are looking for a tasty, quick meal to feed your family, give these a go, they are so good. Place the fish, half the prawns, curry paste, caster sugar and fish sauce in a food processor. Blitz until just combined. Place the mixture in a medium bowl and add the remaining prawns, beans, coriander and the lime leaves. Stir to combine. Place a sheet of cling film on a plate, the mixture is sticky and by placing the cling film, it will help you pick up the fish cakes, when it is time to cook them. Also if you need to put a second layer of fish cakes, place another layer of cling film first. Moisten your hands slightly with water, this stops the fish mixture from sticking to your hands. Roll one tablespoon, slightly heaped, of the mixture into a ball, flatten slightly, place on your prepared plate, repeat with the remaining mixture. 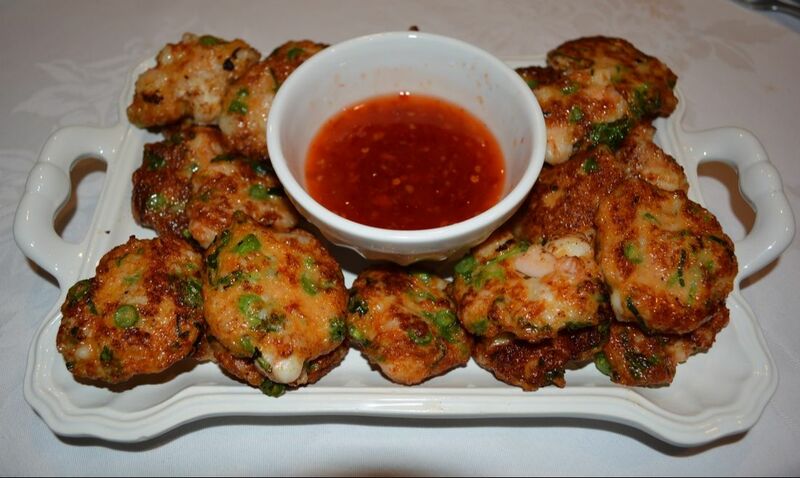 Dipping Sauce: Combine the sweet chilli sauce and lime juice in a bowl, stir to combine. Shallow fry the fish cakes in batches in hot oil until browned on both sides and cooked through, it takes about 2 minutes on either side. Drain on absorbent paper. 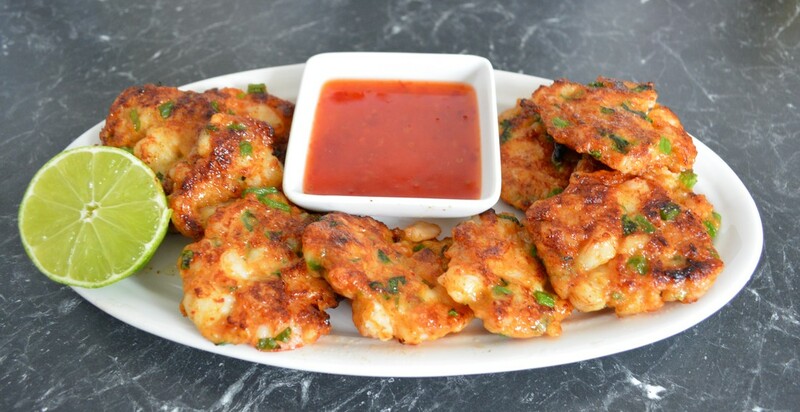 Serve fish cakes with the dipping sauce.